Flexoplex Reviews: Is Flexoplex The Best Joint Pain Supplement? Flexoplex is a natural supplement that is said to help relieve the symptoms associated with stiff, painful joints. In addition to aging, one of the most common reasons for pain in the joints, people can experience inflammation and lack of mobility due to injury or health condition such as Arthritis or Osteoarthritis. Whatever the reason, it can severely affect the quality of life for the sufferer which is why there are many options for relief on the market. Flexoplex claims to stand out among the other joint pain relief products available by being a maximum strength formulation that is fast acting with no side effects. What are Flexoplex Users Saying? 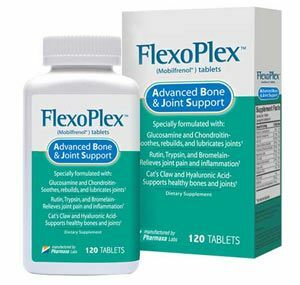 The Flexoplex product is made by Pharmaxa, a company that also produces a topical joint pain product which is recommended for use with the oral supplement. Pharmaxa appears to be a reputable manufacturer who produces an informative, detailed website for their prospective customers. The site provides information about the manufacturer including all contact details, FAQ section, and secure ordering process. They offer occasional discounts on products as well as price breaks for people buying more than one bottle per order. All Pharmaxa products are backed by a 60-day refund policy. Glucosamine Sulfate: naturally occurring in the body, this ingredient ensures cartilage is flexible, agile, and strong. It is commonly believed that this supplement can repair the damage caused to the cartilage by arthritis. Research shows that it can ease pain caused by osteoarthritis, fighting swelling, and lubricating joints. Chondroitin Sulfate: usually combined with glucosamine sulfate to enhance its benefits. Helps rebuild damaged cartilage, reduce swelling in the joints, and improve flexibility in people suffering from arthritis. It can mitigate pain in people with moderate to severe arthritis. MSM: an organic sulfur, Methylsulfonylmethane naturally occurs in the body and in some foods. Along with supplements such as glucosamine, it can ease pain caused by osteoarthritis, relieve pain in the muscles, and distress in the joints. Rutin: a plant pigment (flavonoid) that occurs naturally in some fruits and vegetables. Know to fight swelling that could cause pain in the joints. Used along with bromelain and trypsin to soothe some of the effects of osteoarthritis. Cat’s Claw Bark Powder: from the cat’s claw plant. Used to treat the effects of arthritis and osteoarthritis. It’s an effective anti-inflammatory that could ease pain in the joints by fighting the swelling that often causes it. May also improve the immune system. Boswellia Serrata Gum Powdered Extract: known as Indian frankincense, it has been used in Ayurvedic medicine because of its anti-inflammatory properties. Used in the treatment of arthritis, to ease pain in the joints, and symptoms of rheumatoid arthritis that hinder mobility. Hyaluronic Acid: occurs naturally in the body. HA retains moisture, is an important component of the joints, and is useful in the fluids that keep the joints lubricated. HA can improve the body’s ability to absorb shock, ease pain, and facilitate mobility. Bromelain: found in pineapple juice. Often used with rutin and trypsin to ease pain caused by arthritis, it also lessens stiffness caused by arthritis. In addition, this ingredient eases pain caused by swollen joints. Trypsin: known to ease pain and stiffness caused by arthritis, trypsin is an enzyme found in the intestines, some plants, and bacteria. It can increase mobility, agility, and flexibility in sufferers of arthritis. Anyone suffering from stiff, painful joints can benefit from taking Flexoplex. Whether the pain is just in the morning upon getting up or throughout the day, the Flexoplex formula can support ongoing, long-term pain relief and is perfect for anyone unable to take prescription medications due to possible interactions. It is also good for someone who wants to prevent joint degeneration as they age or have not had any relief from physiotherapy alone. Flexoplex would be highly recommended to anyone looking for a natural way to reduce pain in their joints. It uses beneficial ingredients which have been clinically proven and used in amounts that provide maximum relief. And, because the product is made by a reputable company, consumers can be assured that they are getting a safe and tested product which they can use as long as required. There may be some other incredible joint supplement out there that I haven’t tried but so far, Flexoplex is by far the best. In my experience which spans almost a decade and about a dozen different supplements, nothing works like Flexoplex. It targets pain at its source and doesn’t waste any time in relieving it. It also has a bunch of healthy minerals, enzymes and amino acids for the sustainability of your joints. It is a great way to deal with joint pain and correct it for the preservation of all your joints. As ironic as it may seem since yoga is supposed to be good for your joints, I was experiencing pain in my hips when I would do some poses. I took up yoga rather late in my life and I think I had just done too much damage to my hips when I was younger. In short, yoga couldn’t help it. What Flexoplex has done for me is let me enjoy yoga again. I take it every day I am going to go to a class and I can do every pose with no pain. My chiropractor basically told me that I would need surgery or constant cortisone shots in order to deal with the pain in my ankles. The pain was almost debilitating. I had a constant limp and if it was a cold day, forget about it. I would barely be able to walk at all. I was deathly afraid of the surgery so I tried desperately to find an alternative which is how I came to find Flexoplex. After a month the pain in my ankles subsided considerably and that trend is continuing with each passing day that I use Flexoplex. By the time I finally got to a doctor about my pain and swelling, my joints were in pretty bad shape. He told me a few things we could do, but a lot of it seemed like it either wouldn’t work or would be invasive. I was looking for something natural that could help rebuild and repair my worn and damaged joints and Flexoplex seemed like the way to go. I’ve been using it for quite a while now and it’s been doing a good job. When you’re dealing with joint stiffness and pain, it’s important that you find something you can take long term. It needs to be sustainable to take it, affordable and available. Also, it needs to work well for a long period of time. I have found that Flexoplex is all of those things. I couldn’t be more thrilled. We had been planning a vacation for months and my wife had a lot of things she wanted to do that required physical activity. I’ve been kind of out of shape for a while now and I really didn’t want to let her down, so I started taking Flexoplex to try and prepare my body for everything we wanted to do. We went on vacation and I’ll be darned if I couldn’t do everything I wanted to. Honestly, I was under the impression that “old people” had to take joint supplements. I just didn’t feel like I fit into that group. I lead a very active lifestyle and started noticing joint pain and stiffness in specific joints. I wanted to make sure I could continue with my lifestyle as I always had and so I found Flexoplex and began using it immediately. It has made a noticeable improvement after workouts or exercise and I am on my first bottle. I plan to continue to use it. I ordered Flexoplex about six months ago after having done a lot of research online. Flexoplex was one of the only products that contained all the ingredients I was looking for. I am pleased to say that I found it easier to use than other similar supplements. I find it to be very effective and the price is well worth it, because I’m no longer in pain and I feel like I’ve got a new lease on life. I’ve been telling everyone I know about it! With Flexoplex, I can perform comfortably! Thanks! I’m a musician and a performer, and I have been since I was a teenager. Unfortunately, I was diagnosed with arthritis recently and this made it difficult to play guitar and perform comfortably on stage. My hands and wrists were in terrible pain a lot of the time, and sometimes my ankles too. Flexoplex is a supplement that I discovered on the Internet. In the last few weeks since I started taking it, my symptoms have gone down considerably – especially the pain. I feel a lot better about preforming now, and about my future as a musician. Flexoplex let me get back to my belly dancing! Awesome product! Flexoplex is an arthritis supplement that I have no trouble recommending, and I have tried more than one. I’m only 32, but I was diagnosed with shoulder arthritis a few months ago. This was devastating to me because I’m a professional belly dancer and I need my shoulders to dance. I tried a couple of other supplements with no luck before I started taking Flexoplex. This supplement helped me so much. It brought down the swelling in my shoulders and really lessened the pain. It’s been much easier to dance since I started taking Flexoplex. Flexoplex gets me to work on time. Amazing product! This is a recommendation for Flexoplex natural supplements. I have arthritis, and in the last few months my symptoms got really bad. I’d feel pain all over my body, and my hands and feet were all swollen. It was taking me 2 hours to get ready for work in the morning and this was killing me. Seriously, I found Flexoplex just in time. Every day on it I felt a little bit better, until I was almost back to my usual self. The big bonus here is that I now get to sleep in for an extra hour and a half every weekday! Relief for my arthritis hands from Flexoplex. I’ve had really bad arthritis in my hands and wrists for many years. It stems from playing too many video games in the 80s, as a teenager. No treatment has helped me enough, so I had just been living with it for awhile when I started taking Flexoplex. What an incredible difference! This amazing natural supplement really took care of the swelling in my fingers – and the pain. I haven’t felt this great in years. I’d like to suggest to all arthritis sufferers that you try Flexoplex, the all-natural solution. It really does work! Love this! One of my greatest joys in life is to ride on my motorcycle. I use it to get to work every day, and everywhere else, and it’s also my greatest hobby. When I started getting pain and swelling in my hands and knees last year and was diagnosed with arthritis, I was devastated. I couldn’t ride my bike at all; it was painful and unsafe. I didn’t want to take prescription painkillers, so I sought out the natural arthritis supplement, Flexoplex. This product turned it all around for me. It got rid of the pain and swelling and improved my mobility so much. Now I can ride my bike, and I’m very grateful!